Yesterday was such a fun and busy day! I had makeup to do for an engagement shoot, and from there a mad dash of an hour’s drive to get to a wedding show. Shrey’s engagement shoot makeup came out awesome! She wanted glamorous makeup that photographed well, but still soft and fresh. I was in such a rush to pack up and head over to the wedding show that I forgot to take any pictures! Looking forward to getting the pro pics and sharing them here, later. The bridal show was being held by myweddinglounge. It was an intimate setup with only a dozen vendors and about 30 couples. 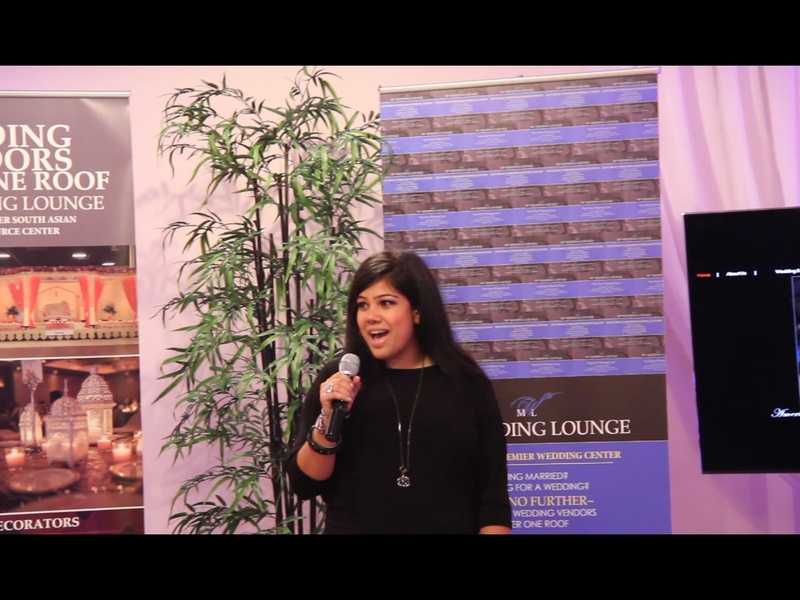 The format was that of a seminar, with vendors presenting advice and tips on how to make wedding planning go smoothly. (Something I wish I could’ve attended when I was a bride!) It was super fancy with lighting and visuals and very modern furniture. It was so intimidating walking in to see the other makeup artists’ setups who’d clearly done this before. My setup was simple: iPad running with images from my bridal portfolio, price sheets with promotions exclusive for the attendees, my blot sheet giveaways, and business cards. With that set up, me and my assistant makeup artist Sanaa got started on the bride that won the raffle to be our demonstration model. Sanaa airbrushed her skin to flawless perfection while I did a quick smokey eye and applied lashes. The idea of those bridal shows with hundreds of vendors all fighting to get your attention seems daunting; but on the contrary the seminar being on such a small scale was great. I was able to present myself to brides who might’ve otherwise never found me, and got to take the time to speak with each one individually. So far every bride I’ve done in the past 6 years was by word or mouth or client recommendation, so it was nice to be able to do something different for a change. The part where went up in front of everyone to talk about my makeup artistry was nerve wrecking. 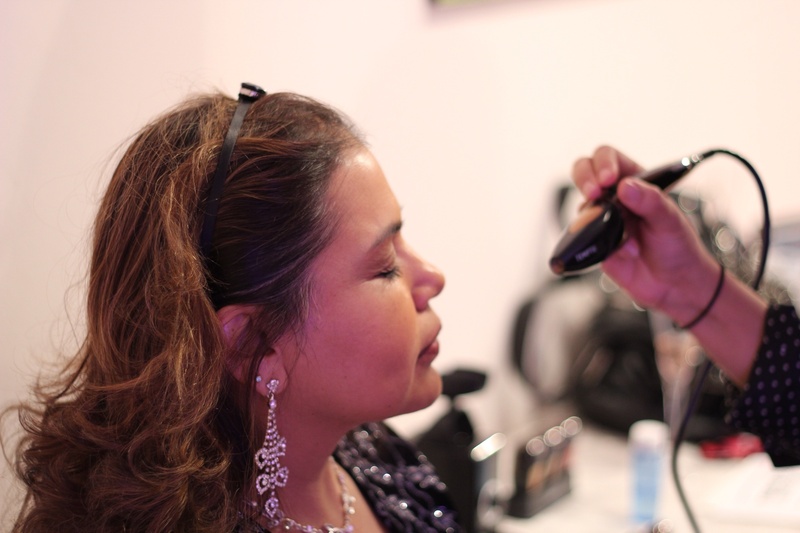 I totally forgot to mention that I offer airbrush, have an assistant makeup artist who helps with getting large bridal parties ready, or that I partner with a hairstylist. I did talk about creating looks for modern desi brides, and felt that resonated with alot of the audience. Mostly everyone who came up to my booth afterwords said that they were looking for a makeup artist who could offer a fresh take on Souh Asian bridal makeup. A number of brides showed solid interest in wanting to setup a trial for their wedding. Looking forward to following up with them and keeping my fingers crossed! So grateful to my amazing assistant makeup artist (and sister) Sanaa for rocking out some great airbrush applications yesterday. And to my rockstar husband for setting up the iPad with a sign-in application for the brides to provide their contact infos and wedding details. Yesterday was such a great opportunity to reach out to brides as opposed to the past 6 years where brides have just been finding me through word of mouth. In addition to meeting brides that I hope I’ll book, I learned alot by seeing how the other vendors presented themselves. All in all it was a great experience and something I’d definitely do again! Previous post ← big makeup day!